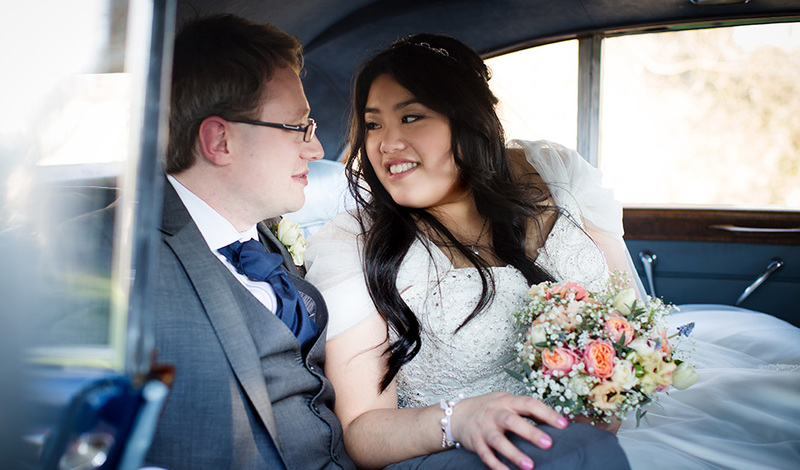 Janette and Joshua’s February wedding was the perfect blend of rustic touches, Chinese traditions and cosy seasonal treats. 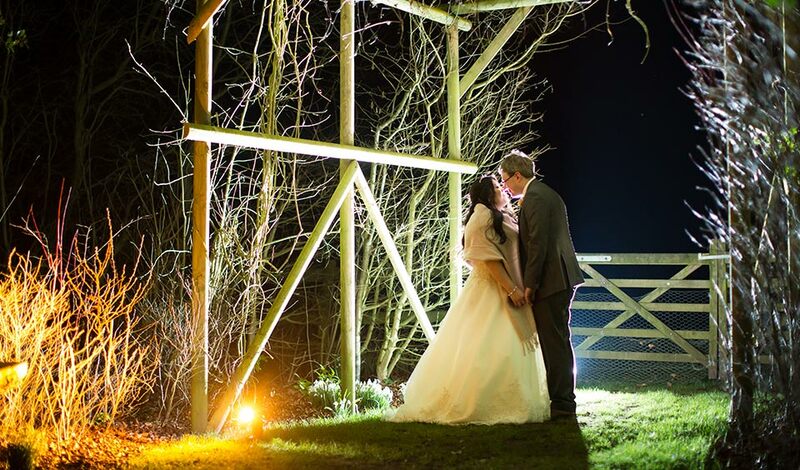 “We were looking for an amazing barn which we most definitely got! 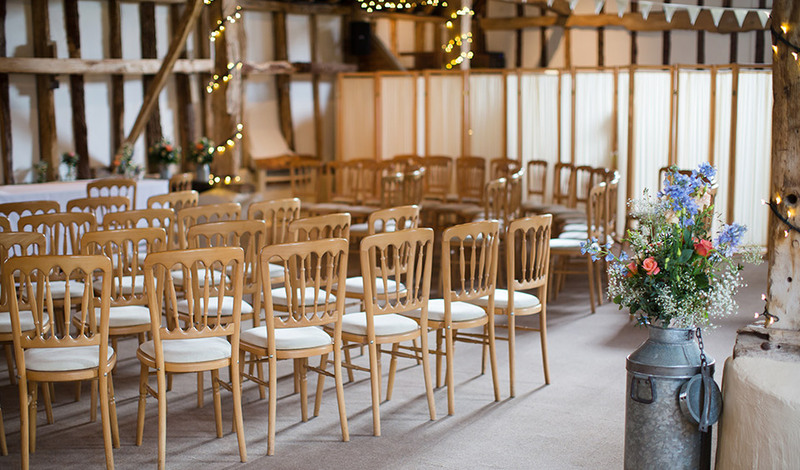 We fell in love with Clock Barn as soon as we got there thanks to the cosy feel and the fairy lights that were everywhere!” – Janette. Janette and Joshua worked with The Blooming Workshop who made floral centrepieces for each table as well as Janette’s beautiful bouquet that was full of contrasting flowers. 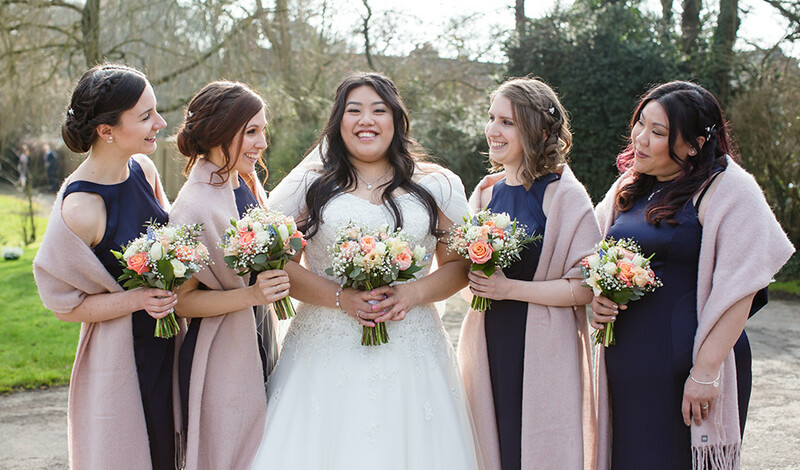 The bridesmaids carried similar bouquets and all were tied with hessian and lace. 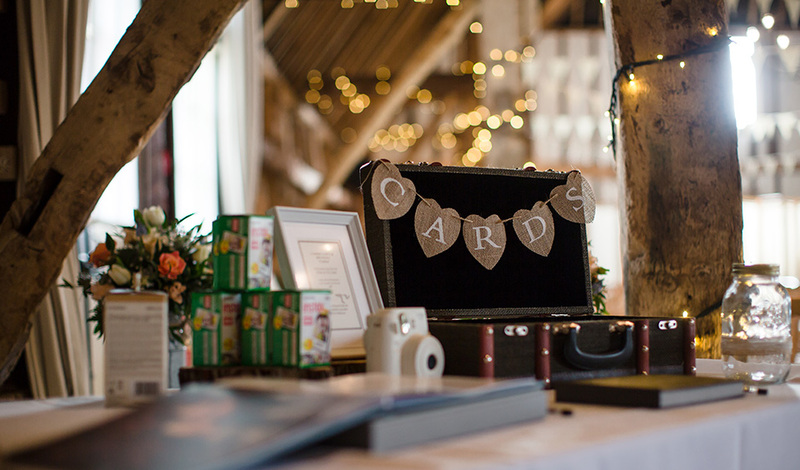 Small jars of flowers were dotted around the barn and the couple made the chalkboard table names and their seating plan. 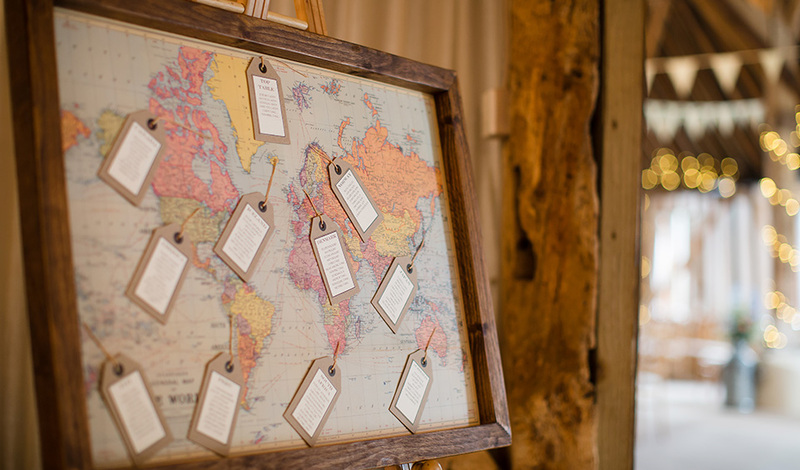 This fabulous vintage map matched the theme perfectly and each table was named after places Janette and Joshua love. 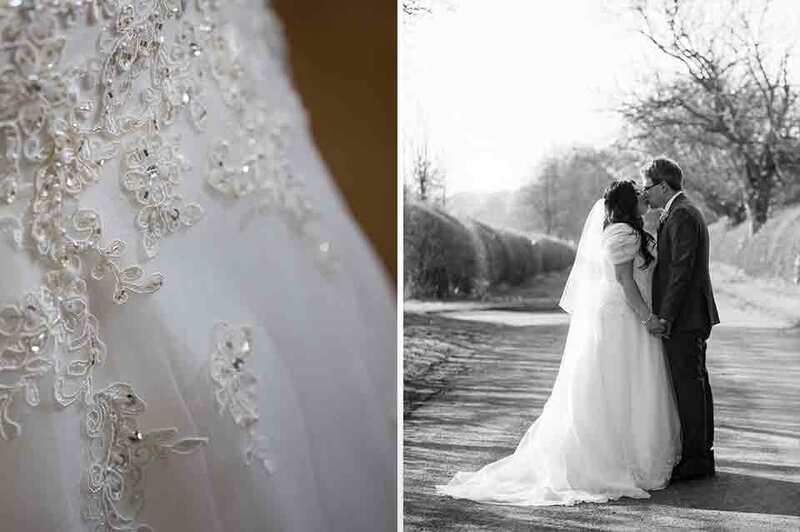 “The dress had a corset that made my waist look amazing and there were details of lace on the bottom of the dress so when it fanned out, it looked like I was floating.” – Janette. 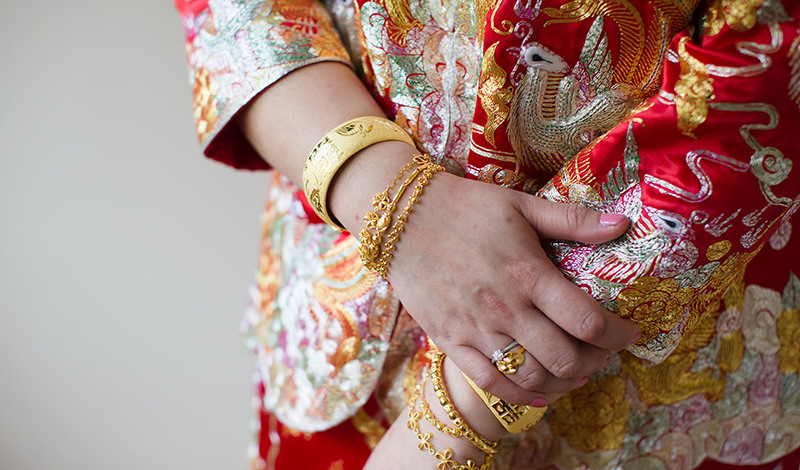 Janette intended on keeping her accessories relatively simple but she was surprised on her wedding day with a necklace and earrings set from her Auntie and Nan who’d travelled all the way to Hong Kong to choose this jewellery. Made at a traditional Chinese goldsmith, the diamonds and pearls looked absolutely wonderful. 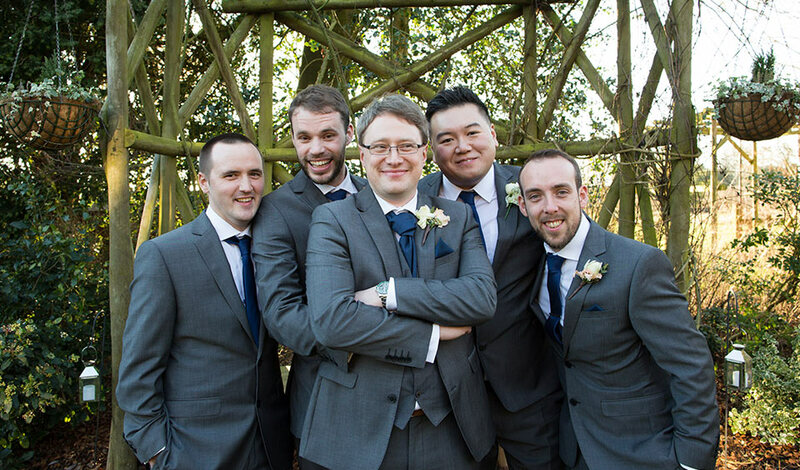 Joshua wore a grey three-piece suit with a navy cravat and pocket square that was hired from Moss Bros. 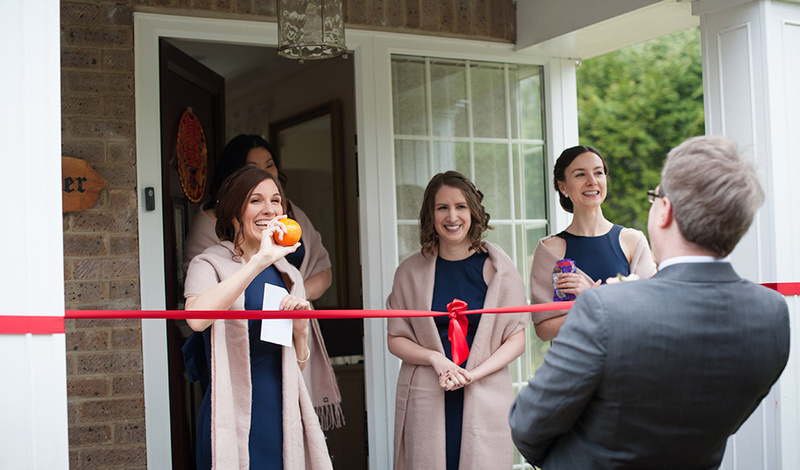 The bridesmaids wore navy dresses from Coast that they’ll most definitely be wearing again! 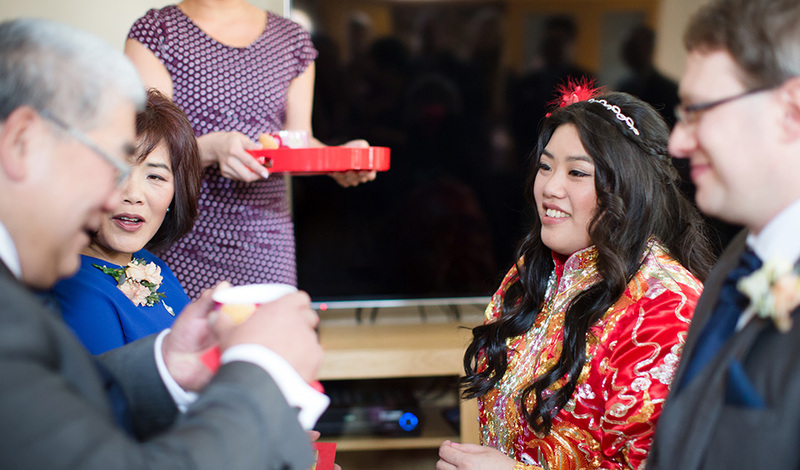 The wedding day itself started with an early alarm call for Janette who, after having her hair and makeup session with Makeovers by Melinda, changed into her traditional Chinese red dress. 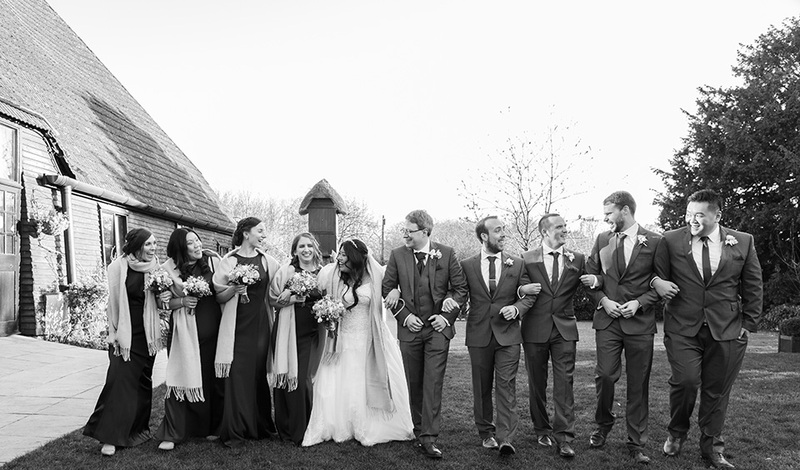 After the legal ceremony at Clock Barn, Janette and Joshua enjoyed the celebrations with their friends and family. There were drinks aplenty and canapés (some of which were Chinese influenced), a fabulous feast and then extra light bites in the evening for any guests who were still hungry. 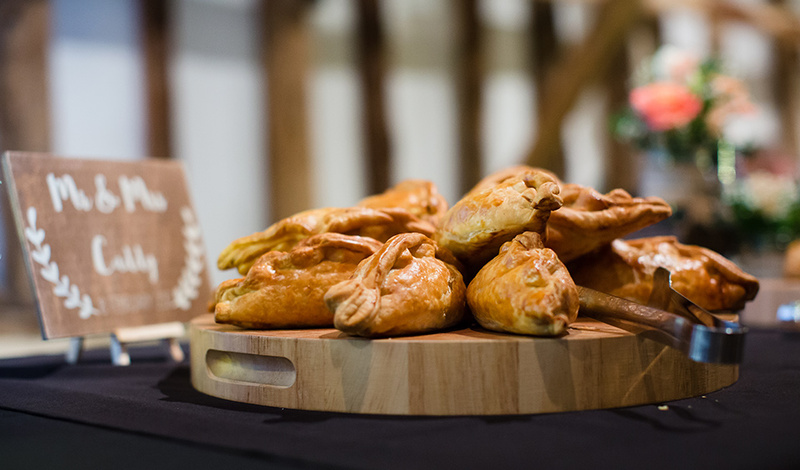 “The food was amazing – our guests all said the Scotch egg starter was brilliant, no one had had anything like it before.” – Janette. 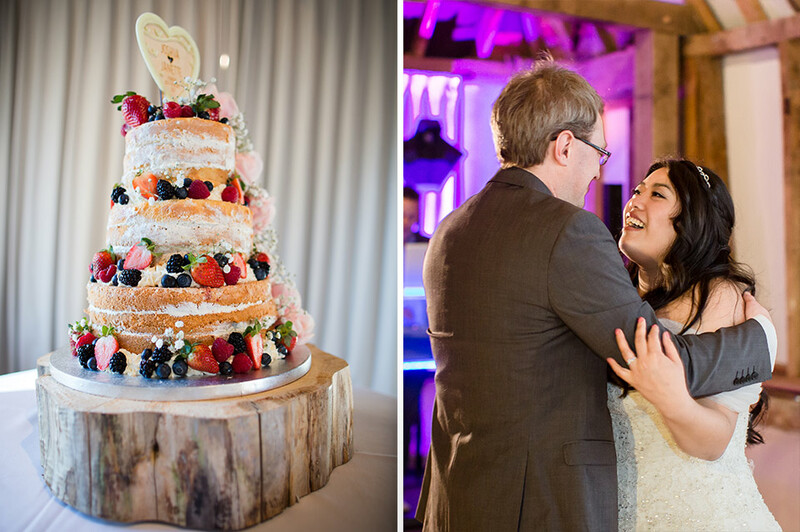 Guests were so well looked after throughout the day with a delicious naked cake that was decorated with fresh fruit, cream and flowers and everyone took home their favours – wooden coasters that were inscribed with the wedding date and the couple’s names. The evening party was another highlight of the day and the DJ read the dancefloor perfectly, playing music that was exactly right for the moment and got everyone on the dancefloor. “We have absolutely no regrets at all. The weather was amazing, we had all of our family and friends there and we had the best food and music. We can’t think of anything we’d want to change.” – Janette. 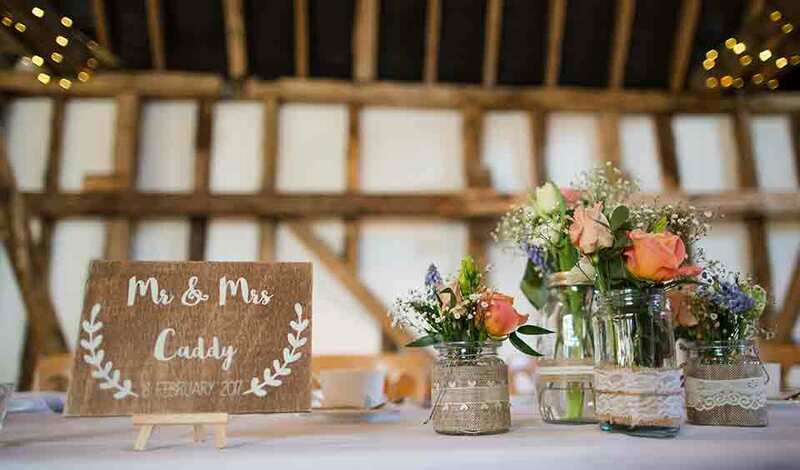 If you’re thinking of a summer celebration at this stunning wedding venue in Hampshire, then you have to take a look at Millie and Ash’s Rustic Country Wedding and find your inspiration!